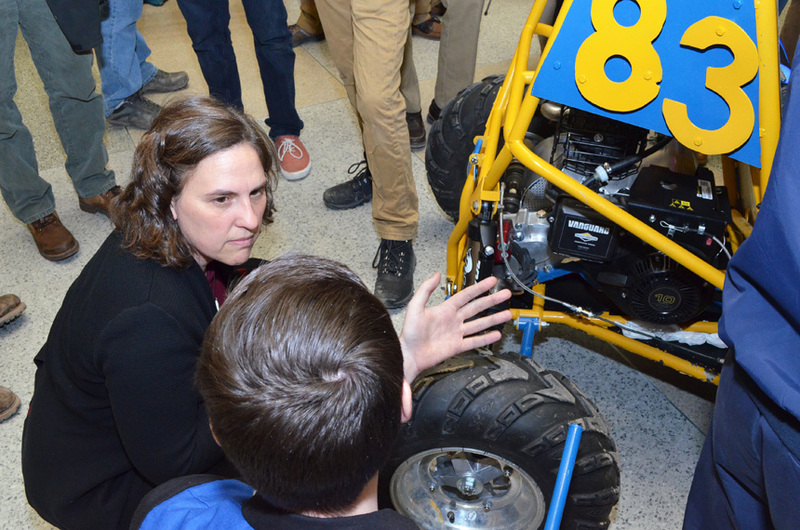 Increased ride height and a new continuously variable transmission have been incorporated into the off road vehicle that students of the University’s Baja SAE team will drive into competition later this spring in California and Kansas. 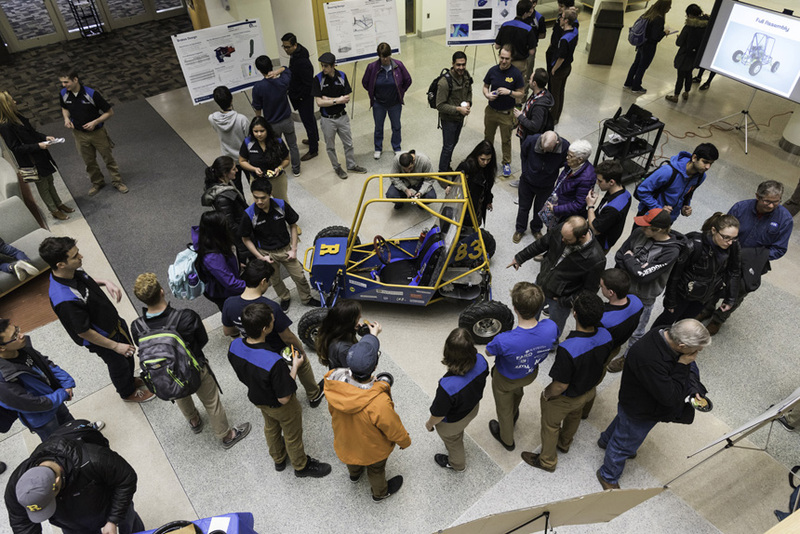 Team members unveiled the vehicle recently in the atrium at Goergen Hall, along with posters illustrating the latest changes in drivetrain, electronics, frame, exterior design, suspension, and usability. Each year the team designs and builds a new vehicle to enter in the four-day competitions against a total of 100 teams from worldwide. The events feature not only a four-hour endurance race and grueling hill climb, acceleration, suspension, and maneuverability contests, but “static” events such as engine check, technical inspection, brake inspection, sales presentations, and a design competition. “I think we’re going to do extremely well in endurance, which is one of our strong suits, as well as sales presentation,” said Baja president Kevin Bonko ’17, a mechanical engineering major. The ride height was increased in order to “take obstacles better and not get stuck on things such as logs and rocks,” Bonko said. The new Gaged continuously variable transmission has a low-end ratio better suited for the 10 HP Briggs and Stratton engine the teams are required to use, and should improve the vehicle’s acceleration, explains Gilead Biggie ’18, the drivetrain team leader, at the team’s website. About 25 to 30 students have been “active” participants in designing and building the vehicle this school year, Bonko said, with a good core of freshmen and sophomores to carry on after older students graduate. “It’s a good spread of all classes,” Bonko said. 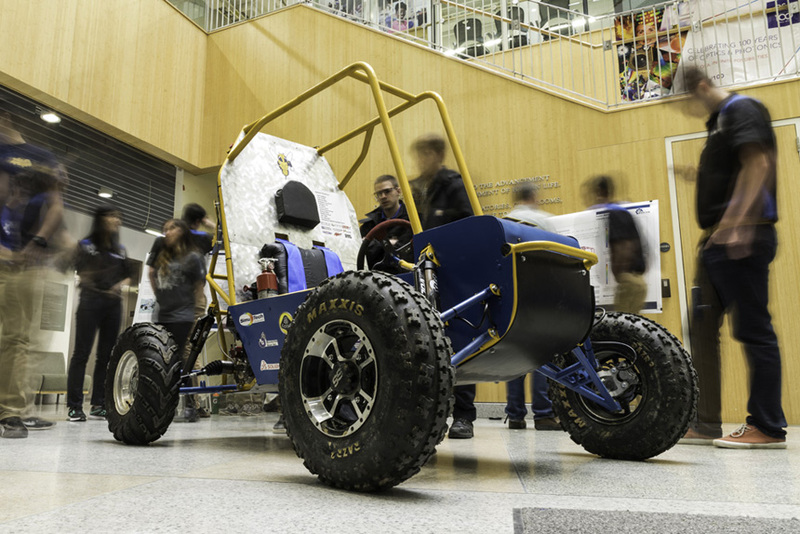 The team is entered in Baja SAE competitions at Quail Canyon Special Events Area in Gorman, California April 27-30 and at Pittsburg State University in Pittsburg, Kansas May 25 to 28. 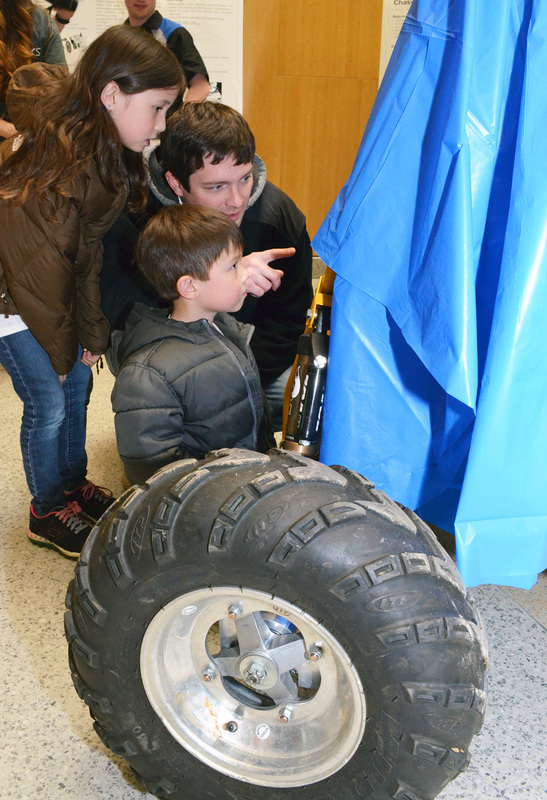 The turnout for the unveiling included Zach Eastman of Pittsford and his children, Wesley and Julia (below).